There comes a time in a music mogul’s career, usually sometime after winning many awards and accolades, when they feel the need to change things up. Some shift to merch, others to liquor. If you’re Diddy, maybe it’s a little bit of both. But for Dr. Dre, he’s “been there and done that.” So, when his longtime partner Jimmy Iovine brought the idea of speakers to Dre, the pair were ready to upend the music industry yet again. The launch of Beats by Dr. Dre wasn’t just the beginning of another headphones line; it was a chance to completely change the way people listen to music. And soon, with the help of pop culture’s biggest names, the world would experience exactly what the brand set out to accomplish—sound the way artists and producers intended. In just its second year on the scene, Beats began collaborating with icons from just about every corner of pop culture. At the time, headphones weren’t considered fashionable. They were stock, basic, something that came with a phone. Until Lady Gaga came along. Her signature Heartbeats earphones marked the beginning of a new industry standard. The release of those in-ear headphones not only extended the Beats product line, but also ushered in a slew of well-known faces that would ultimately help alter the brand’s trajectory—from a rising rapper named Drake including Beats in his “Forever” music video, to GOAT-in-the-making LeBron James playing virtual poker on a Beats-branded computer. The appearance of the King in the video provided a glimpse of what was to come, as Beats was plotting one of its most important partnerships yet. LeBron James is no stranger to the gym. He’s undoubtedly one of the most—if not the most—dedicated athletes when it comes to time spent training. So when Beats by Dr. Dre wanted to make a sports headphone, James was the perfect match for the collaboration. The 2010 MVP helped design Powerbeats earphones with Beats by Dr. Dre to deliver the sound and performance that could take him to the next level. This would prove to be the first of many collaborations with the King. What level will they take it to next? Ever the businessman, Dr. Dre didn’t just announce his return to music in 2011 by dropping a track—he did it with an ambitious partnership with Chrysler. The collaboration came in the form of BeatsAudio. Available in the Chrysler 300s, the system brought the same sound quality Beats was known for to music lovers’ rides. This wasn’t just an evolution of Beats, it was proof of something more: the brand was bigger than just headphones. By now, the lore of Beats was growing. They’d left their mark on the stage, the court, and with the Chrysler partnership, the streets. But still, something was missing—a truly global stage. So with the 2012 games in London on the horizon, Beats set its sights on the entire world. They created exclusive flag-inspired headphones and gave them to dozens of elite athletes. Before long, Beats headphones were everywhere: in the tunnel, on the starting line, steps away from the medal podium. The world’s best wore Beats as a symbol of defiance. But the summer games weren’t the only way the brand went big in 2012. Earlier in the year, Lil Wayne also debuted a pair of diamond-studded Beats worth a cool $1 million at the NBA All-Star Game. As an artist, Dr. Dre knew that if he wanted to stay fresh, he had to reinvent himself. And as a businessman, things were no different. Entering its sixth year in existence, Beats reinvented the crown jewel of its product line, and later introduced a wireless version of its famed noise-canceling Beats Studio model. To celebrate the new release, Beats launched the “Hear What You Want” campaign, telling the story of the noise that Colin Kaepernick had to rise above as one of the top young quarterbacks in the league. Along with an Imagine Dragons-backed Powerbeats ad featuring LeBron James, the brand continued to engrain itself in popular American culture. Just a year after giving the Beats Studio headphones an upgrade, Beats decided it was time to give their whole product line a makeover. Top to bottom, big to small, a full sweep. Powerbeats, Solo, and Solo Wireless headphones all saw second-generation updates. With so many revived products hitting the marketplace within the same year, things were looking like they couldn’t get much better for the brand. Then Apple came calling, acquiring Beats Electronics, including Beats by Dr. Dre and Beats Music®, for $3 billion. The partnership with Apple meant that Beats was ready to unleash the full power of its brand and products. As Beats continued to grow, so did what the brand stood for. Self-reliance and independence, both born from a place of defiance, these tenets were the soul of the brand. And in 2015, with the theatrical release of Straight Outta Compton which told the story of Dr. Dre (played by Corey Hawkins) and his N.W.A. bandmates, Beats empowered fans to share their own. The “Straight Outta Somewhere” meme generator allowed people to rep their roots in a fun, memorable way. From “Cincinnati” to “Connecticut,” “cash” to “f*cks to give,” truth and personality were the common thread. With Compton-native Richard Sherman also appearing in a Studio ad that same year, the neighborhood partially responsible for the ambition behind Beats was put on the map in a way like never before. Beats is known for aligning itself with emerging artists who are defiant in their own right. So when Dr. Dre’s Aftermath Records signed Anderson .Paak, a triple threat rapper/singer/drummer with a distinct and commanding voice, it was only right that Beats was there. In the lead-up to Dre and Anderson .Paak’s memorable 2016 festival performance, the pair’s creative chemistry was documented for a short film called All in a Day’s Work. Presented by Beats, the clip gave fans an exclusive behind the scenes look at how a legend and a rising star worked together all in the name of music. In 2017, Beats recognized that the world was noisier than ever before, and embraced the idea of using music to block out the noise and negativity—like Serena Williams proving to critics that motherhood doesn’t get in the way of a career. After a decade of defying convention, countless collaborations, and relentless innovation, Beats shows no signs of slowing down. 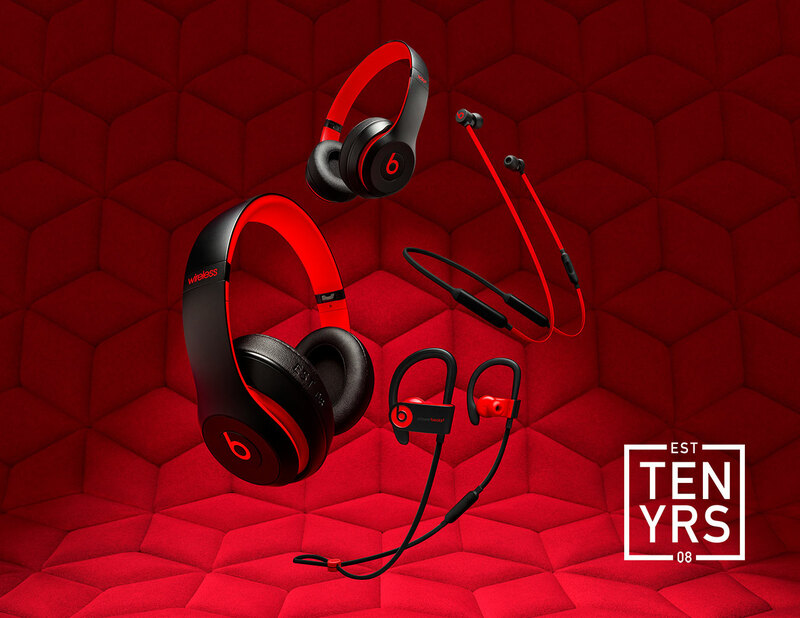 This year alone, the brand unveiled its Decade Collection, celebrating its roots by bringing back Beats’ iconic red and black colorway. It’s been a hell of a decade for Beats by Dr. Dre. We can’t wait to see (and hear) what’s next.